Looking back, it all makes sense now. God had a plan for me that I couldn’t have understood at the time, but today, I do. Two years ago today I had the surgery that changed my life. I have had back pain since grade school. It’s always come and gone, and usually chiropractic care or muscle relaxers and pain pills (if it got really bad), did the trick. Then in September of 2014 when I found out I was pregnant with my second son, my back pain became constant, and worse than ever. 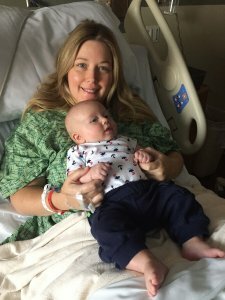 I spent my entire pregnancy in excruciating pain. Excruciating. The pain was constant, and sharp, and at times, it made me feel like I was going completely crazy. I was heavier than I wanted to be when I got pregnant, but being in constant pain meant that any movement also hurt, so I was also very sedentary during my pregnancy causing me to gain more weight than I should have. The only “activity” I got was chasing my 3 year old around, and thankfully he was understanding that Mommy hurt and couldn’t play too often. Typing that is hard. I can remember the guilt of being so uncomfortable, yet torn, because my son wanted to play, and I just couldn’t because of the pain I was in. 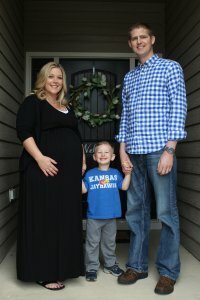 What started as “just back pain” early in my pregnancy, began to travel down my leg and make my foot numb. I can remember New Years Eve 2014 laying on the table at my chiropractors office bawling. I could hardly move without nerve pain just shooting down my leg. We’d reached a point that what they were doing wasn’t giving me any relief, so they referred me to another chiropractor who did acupuncture. You may be wondering why I wasn’t talking to my doctor about this, I was, she had prescribed me muscle relaxers that I would take only if I couldn’t take the pain any longer. 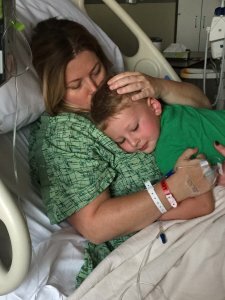 I hated taking them, and they gave me no relief, they just made me exhausted and it was really hard to care for my son when I was in pain AND tired, so they just weren’t helpful. 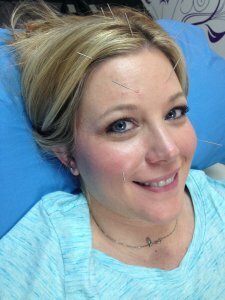 Once I began acupuncture I found a little relief. When the needles were in it was the only time I felt little to no pain, and I felt calm. It would give me relief for a short period of time, then the pain would come back with a vengeance. I had convinced myself that once I had our son, and the pressure was off my sciatic nerve, I would be ok. I would no longer feel pain and I would go back to chronic, yet livable, back pain. I had our second son in June of 2015, he was a scheduled c-section and I actually begged to have him 2 days earlier than we’d originally planned because the pain was so intense and I just wanted him out because I felt like my body was giving up. My back was so inflamed from the pain it took the anesthesiologist almost 30 minutes to give me my spinal tap. And every time he missed, the pain shot down my leg directly down my nerve… I have never felt pain like that. At one point he leaned over me and apologized profusely for the trouble he was having, but I was so inflamed he couldn’t even find the correct placement. It was awful, but he finally got it and our son was born. On June 5, 2015, we became a family of 4. That pregnancy was the most challenging period of my life. I have never experienced chronic pain like that and now have perspective on people who live with it. It is horrendous. It is so difficult to be happy and enjoy life when you are in constant pain. I get it now and wouldn’t ever wish it on anyone. 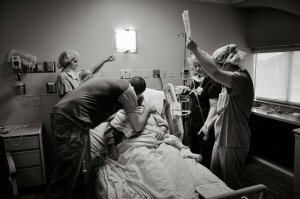 Soon after he was born, my spinal tap wore off, but I was still on pain meds since I’d had a c-section. I felt little to no pain for the first time in months. I thought exactly what I’d prayed for, happened. 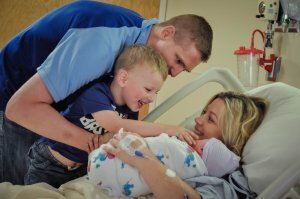 I had our son, the pressure was off my nerve, and I would be healed. But, as I weaned off pain meds over the next week I came to realize the pain was being masked by the meds and I in fact, was still in just as much pain as I was during my pregnancy. Now I knew something was really wrong. At my 6 week postpartum checkup I asked my doctor what she thought we should do and she suggested an MRI. I always had this horrible fear of back surgery, and I told her that. She told me that a very small percentage of people with back pain actually need surgery, so I agreed to an MRI. My MRI was on a Monday and they told me I’d probably hear something on Friday. Tuesday afternoon I received a phone call from my doctor saying there was no question, I needed surgery and I needed it as soon as possible. I had a herniated disc between L4 & L5 and it was large enough that it wasn’t going to fix itself, I needed surgery. They told me the bulge was huge, they couldn’t even see the nerve root because of the herniation. I can remember getting off the phone and falling to the floor and bawling hysterically. Why was this happening? I was a stay at home mom of a 3 year old and a newborn. I wasn’t supposed to be spending that fall recovering from surgery. I was supposed to be soaking up baby snuggles, and giggles, and first day of preschool and playdates. The surgery I needed was a Microdisectomy. A laser would essentially go in and remove the bulging part of my disc and alleviate the pain. The scar would be minimal, no fusion, which was good, but the devastating part was recovery. When they called to tell me what recovery looked like, that was when the wind got knocked out of me. During recovery I would not be able to lift any more than 10 pounds. My baby, was 12 pounds. I was not going to be able to carry my baby. As I write this tonight, tears are streaming because I can remember exactly how I felt in those moments. I felt helpless. I couldn’t go on living in as much pain as I was in, but if I had the surgery, I couldn’t care for my sons the way I should be able to as a 34 year old mother should. I didn’t have an option, no matter how hard it was, I had to have the surgery. When our boys were 3.5 and 12 weeks old, I had back surgery. Recovery was 3 months and I couldn’t lift more than 10 pounds, nor could I bend, lift or twist during that period of time. I was no longer going to be caring for my children during the day because I was physically unable to. By the grace of God, my neighbors cousin was marrying a girl who needed a job during that particular semester… and so we found ourselves a nanny. Our nanny, Chelsey, was a gift from God. She arrived in our home before my husband left for work and didn’t leave until he was home during the week for 3.5 months. My Mom covered a morning each week that she had class, and besides a few other days that friends and family covered, Chelsey spent her days with us. She served as my hands where I couldn’t. I’ll never forget sitting in the rocking chair for her to place my baby in my arms so I could rock to him and sing him a song, then I’d text her to come back in his room, where she’d have to take him out of my arms and lay him in his crib. Those moments are so fresh in my mind. I do not ever take for granted laying my son down in his crib now, that privilege was taken from me for so long. My brave boy who spent countless hours with me at doctors appointments during my pregnancy. I am so thankful for his patience. I would go through the pain all over again to have him. 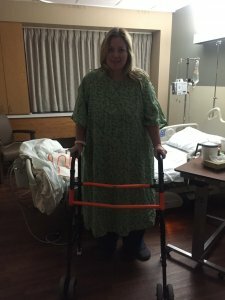 First time standing after surgery… no back pain or nerve pain! During my recovery there were days I felt that life was so unfair. Forget the surgery, I was glad it helped my pain, the recovery was what wasn’t fair. I hated not being able to be the Mom I wanted to be. It was during this time that a fire was lit inside of me, a fire that still burns today, two years later. During that time, I had serious conversations with my Neurologist and my Chiropractor about my weight. I was 258 pounds and I’m only 5’4″. I asked for a straight answer, and I got it. My weight was not helping my back, and the only way to ensure that I wouldn’t need another back surgery in the future was if I lost weight and strengthened my core. And so my “why” was born. My “why” is not about vanity, or about the size clothes I wear. It’s not about being able to wear a tank top or go without Spanx. It’s not about being at a certain weight for an event, or getting compliments from people. Those reasons are all “surface reasons” and they wouldn’t keep me going. My “why” is because my body was broken from the weight I used to carry. I carried emotional weight from my eating disorder, and that turned into extra physical weight, that then contributed to my back issues. It was time to finally release the burden I carried physically and emotionally and create a new life, a life where I could be free from food for good and it would no longer take away precious moments of my life. On November 14, 2015 I walked into Weight Watchers. I was still unable to pick up my son. I was still in pain. I was embarrassed to walk back through those doors, because I had been a member just 2.5 years prior and had gained back 80 pounds since I’d left. I just knew they were going to be shocked at the weight I’d put back on. But, you know what? They may have been shocked, but I never knew it. I was greeted with hugs, and smiles, and encouragement. I sat there at that meeting and knew that THIS time was different. This time my “why” burned so fiercely I knew I wouldn’t fail. I would never give up again, because giving up almost broke me. My back surgery may have been a fear for years, but looking back, my back surgery saved me. God broke my body so I would finally appreciate it for all that it does and for all it has given me. After years of self hate, He gave me perspective. My body has given me two little boys who call me Mom… and there is nothing I am more proud of than that. There are so many things I don’t take for granted now. Like running with my kids, or giving piggy back rides, or putting a puzzle together on the floor… I couldn’t do those things for so long. Being a mother is an honor and a privilege. I will fight to live my best life, with a fire lit deep within me, so my sons will see a Mom that fought through hell and back to prove that God gives the hardest battles to his strongest warriors and that He always, always, always, has purpose for our pain. 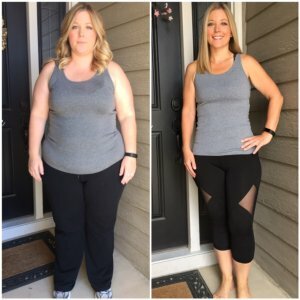 *Since this post was published I am no longer a Weight Watchers member and have embraced Intuitive Eating because my hope is to raise children who have healthy relationships with food and their bodies. Intuitive eating is allowing me that privilege. You can read about it here. 🙂 You are on your way to healing, Lucy!! How long did it take to recover from your surgery? I had a laminectomy a week ago. I’m ready to play with my kid again soon! You said in your previous post that we could reach out to you for help, which has given me hope. I’m turning 60 in November and have dealt all my life with emotional binge eating. I too am doing Weight Watchers wrong. Since joining in November (9 months) I’m only down 5 lbs and am struggling to keep from putting that back on. I’ve tried a nutritionist and every other weight loss program out there but the issue is still underlying. Can you please give me some advice of how to change this insanity once and for all? Hi Cindy, My recommendation would be to find a therapist in your area that specializes in emotional and/or disordered eating. It doesn’t matter what weight loss program you choose, if your mind isn’t right, you won’t have lasting results, or you won’t have success. Your mind is such a powerful tool on this journey. A few books I recommend are Made to Crave by Lysa Terkeurst and Women, Food and God by Geneen Roth. Both of those books really dive into the emotional aspect of our weight issues. Know that you are worth the work that it will take to change your mind… it will change your life. It won’t be easy but it will be worth it. Lia, this is YOUR year! I believe in you!! I don’t have any recipes on my blog yet, but I do work for a food blogger and use a lot of her recipes. You can visit her site at http://www.slowcookergourmet.net. Subscribe to my blog and as I post recipes and blog posts you’ll be the first to know! Thanks! Your blog has been an amazing find today. Binge eater that kept weight off by working out hard 6x/week until I herniated 3 disc. All are “small” and surgery was not offered. I can function day-to-day but pain does not allow me to workout anymore. I have gained 25 pounds in 2 years. When you are only 5’2″, that is a lot. I laugh and say I am back to my baby weight. But it is not funny. Being in my late 40’s with all sorts of female issues does not help either. Anyway, I had a new MRI today. I am waiting to hear from doctor now. I have signed-up with WW and hope that I can stick to it. Thanks for sharing your story. Congratulations on your success! Hi Jackie, I hope your MRI showed what you wanted it to and that you can find a way to eliminate your pain. I wish you much success on your WW journey and pray that it helps you feel better one day at a time! Cannot find your “your must have recipes”……. I’m ugly crying reading your story.You have written my story just about word for word. I have my son at 40. He was around three months old when I herniated a disc and had to have my third back surgery. I know the pain, both physical and emotional, of not being able to hold your baby and take care of your baby. He’s now three. I’m trying to find my motivation to lose weight. I know my why is my son but I also carry emotional baggage and am an emotional eater and binge. I need to find my way. I’m trying to find my way. Thank you for sharing your story. I get you, Andrea. I really do. It took me until my youngest was 5 months to be ready for this journey again. I knew I had to be in the right mindset before starting because if I wasn’t, I’d give up. I know you can get there. I’d encourage you to pray about it. Ask God to give you the desire and the drive to want to do this for yourself. He’ll make a way for you. Praying you find your peace soon.